valley, Court Farm, Treats, Capel-y-ffin, Cwmdu, Crickhowell. Canoeing, horseriding and other outdoor activities are available nearby. 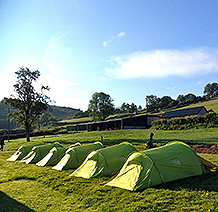 £5 per person per night for DofE and Educational groups only. To enable adherence to schools' policies, we can provide onsite overnight accommodation for school staff at no extra charge. Booking is essential. Please enquire for details. Suitable for all levels: Introduction, Practice, Bronze, Silver and Gold Awards. Toilets, showers and pot wash sinks. Separate facilities for staff and leaders if required. Large foul weather shelter for preparation, cooking and eating (if permitted). Hook-up connection. Dedicated rooms for educational purposes with a white board and projection screen. Ideal for presentations. Fridge available in classrooms for staff use. Large car park suitable for coaches. Wi-fi is available for accompanying staff of groups, only. 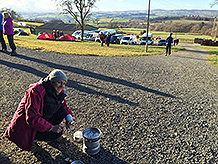 4G connection can be obtained on the Campsite. Click here to enjoy this student's video showing how much fun a group, camping at Newcourt had on a Gold Practice Expedition. 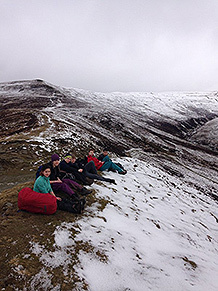 Video of Gold DofE Expedition on the Black Mountains. 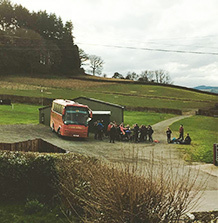 A video created through the eyes of a teacher at Newcourt Expedition Campsite. Follow this route starting and ending at Newcourt. Located in the Black Mountains, Brecon Beacons National Park. 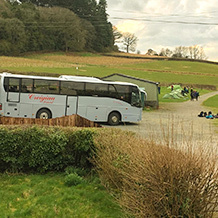 Newcourt campsite is open to schools and groups from 15th March, weather permitting. 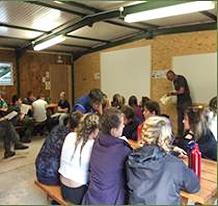 The camping season for Duke of Edinburgh Award Scheme groups starts and ends with British Summer Time (BST). DofE groups are welcome before and after British Summer Time (BST) with permission from the Local Expedition Area Co-ordinator. The area is suitable for multiple expeditions from Bronze to Gold as well as training, practice and qualifying ventures. Hill, field and forestry routes available. Direct Access from the campsite to four separate public footpaths, suitable in kilometres duration for Silver and Gold expeditions. One footpath leads from the campsite across farm fields, by the forest, directly to the mountains without using highways. Low routes suitable for Bronze expeditions or foul weather planning. Higher routes provide challenging areas for Gold groups and access to a triangle of DofE campsites. Campsite has capacity for several groups at anyone time with space for supervisors to pitch away from group. A seperate toilet and shower is also available for supervisors if required. 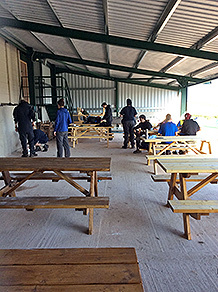 We have a spacious open fronted shelter for preparation, cooking and eating in case of extreme foul weather conditions (if expedition permits). Two rooms have been dedicated for educational use with a white board and projection screen. These can be used for field studies, route planning, map reading and presentations. The Brecon Beacons is one of only 9 in the world to be awarded International Dark Sky Reserve status. Great for stargazing. You will be amazed at our night sky. Space for mini buses and canoe trailers to be left at Newcourt at no extra cost during your expedition. If travelling by large coach the most suitable access route is from the Talgarth junction heading towards Felindre. You are advised to use a paper map from this junction as sat nav is not always reliable. Please pass this information on to your coach company. For campsite risk assessment click here “Risk Assessment”. For details of Public liability insurance please ask. There is good mobile phone reception on the campsite making it ideal as a base camp. Mobile phone signal is limited/non existent in certain areas on the Black Mountains. We recommend that a check system is arranged with your groups to track whereabouts on a regular basis. Reflective rucksack covers are ideal for locating your group on the hill with binoculars. Advance Mobile Location (AML) is worth considering when planning your Expedition. Ordnance Survey have updated their free to download OS Locate app. More information here. Do you know who to call if there's a walking or climbing emergency? Check out this information. Payment by cash, cheque (payable to Mills Bros) or by arrangement with group organiser. For BACS details please ask. Payment accepted in advance or at time of visit. Invoices can be mailed if required – please request. Do not forget to complete your green form and submit at least 4 weeks before your expedition download here. eDofE Mapping is a free, optional expedition route mapping tool designed to create DofE route cards and route summaries. It can be used by participants and Leaders through eDofE. eDofE mapping is simple to use. Digitally mapping your route is quick and easy: set your waypoints and checkpoints, then add descriptions and escape routes to generate your route card and a route summary. viewranger.com is also useful but may require a subscription. Visit us on Facebook by following this link. Visit us on Instagram by following this link.